Oh! You just lost your iPhone passcode and previously, you did not set up iTunes on your device? This is a not a big problem. It can be dealt with and many iPhone users have successfully used the solution in this piece to recover their device without a passcode. Let us start with why you should not enter the wrong passcode more than once. What Happens If You Forget Your iPhone Password? If you forget your iPhone password, your device might be disabled for security reason, but this will only happen if you have entered the password more than once. You will get a notification that your device have been disabled. At this point, you need to find a way to open it. You can do that using the same ways I used. First, you can use iTunes. Again, this depends on whether you have synced your iPhone device with iTunes previously. If so, you can choose to erase your device. If not, you will have to use other methods without a password. We will talk about this later in this piece. LockWiper? Yes! This is a wonderful app that was developed for iPhone issues and will effortlessly fix forgot iPhone passcode without iTunes. 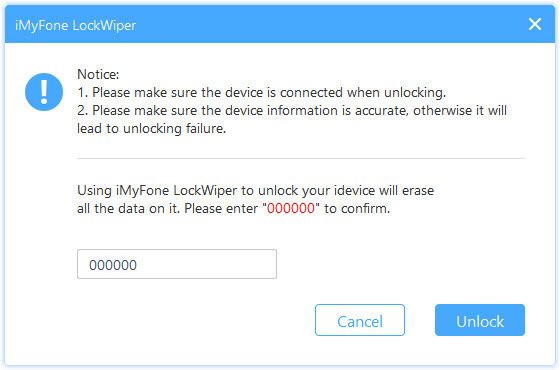 iMyFone LockWiper will unlock all kinds of iPhone no matter what the problem is. All you need to do is to have the software and you will solve any iPhone issue. Besides, there are more benefits of using LockWiper. For instance, you can use the program to unlock any type of iPhone quickly. Even unresponsive devices are not left out. LockWiper will make them responsive and open them. Unlock any lock type: 4/6 digit passcode, Face ID, Touch ID, custom numeric code, etc. Help you also out of Apple ID lock issues: Remove the old Apple ID and let you sign in a new one. Step 1: Download and install LockWiper on your computer. Launch LockWiper and connect your iPhone. On LockWiper, click Start to begin. 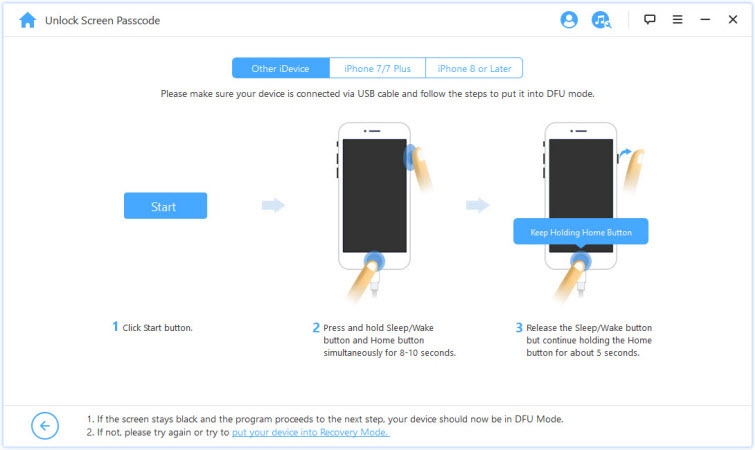 Step 2: Choose you device model from the up tabs and follow the onscreen guide to get your iPhone into recovery mode. Step 3: When your iPhone is in recovery mode, you will be guided to the next page. Your iPhone will be auto detected. Confirm or correct your iPhone info there and click Download. 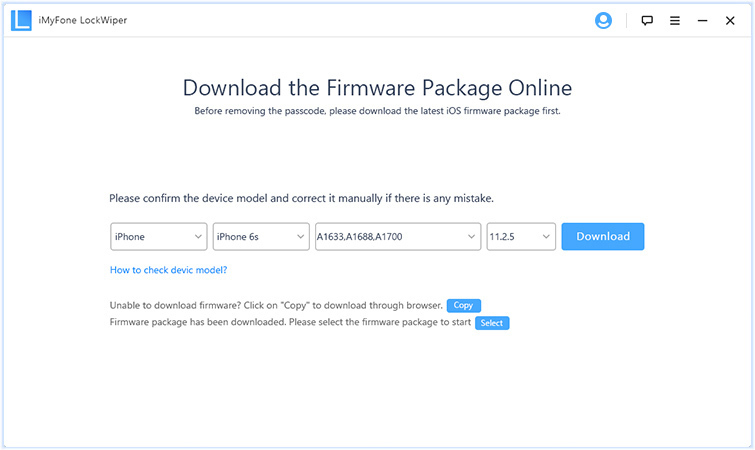 Step 4: When firmware is downloaded, click Start to Verify. Once the firmware is verified with your iPhone, click Start Unlock. Step 5: You will be asked to enter 000000. Do it and then click “Unlock” to get started. You can use iCloud to fix forgot iPhone passcode as well. iCloud will erase your device and restore it to previous settings. However, before you can use iCloud to fix the problem, you must have enabled Find My iPhone prior to forgotten your passcode. Step 1: Open a browser on your device or computer, go to icloud.com. 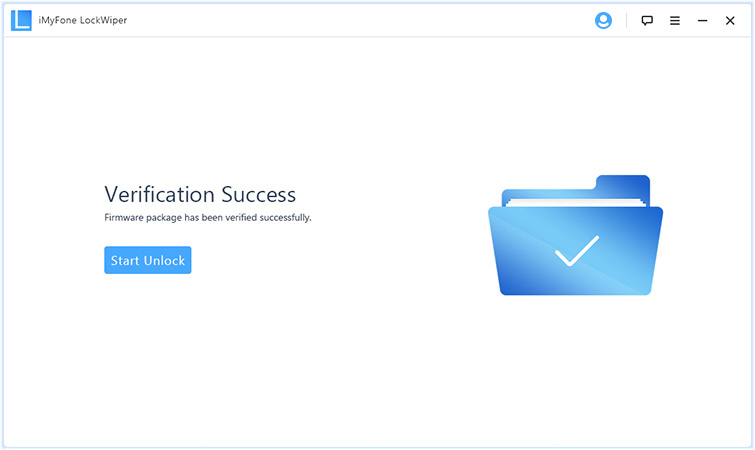 Step 2: Sign in with your Apple ID and passcode which your iPhone is associated with. Step 3: Find and click “Find iPhone”. Step 4: Tap “All Devices” and locate the device you forgot passcode. Step 5: On the small window, you will see the “Erase iPhone” option, click on it. Step 6: Confirm that you want to erase your device to get started. Your iPhone will be remotely erased when it connects to internet. That means, this method is only available when your iPhone has internet. So far, you have seen that you have a good solution on the ground in case you forgot iPhone passcode. You can fix it without using iTunes. I recommend iMyFone LockWiper to you for your iPhone issues.